Swastikas and "Smelly Jews" spray-painted on tombstones of Jewish cemetery in Tatabanya, Hungary. 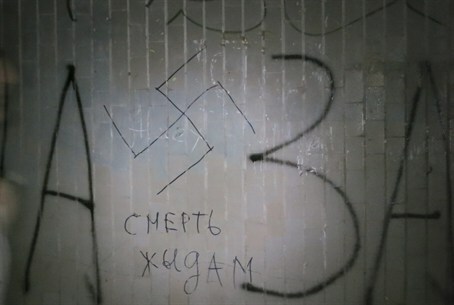 Residents of the Jewish community in Tatabanya, Hungary, were shocked to discover on Friday that unknown vandals had desecrated the local Jewish cemetery. "They spray-painted swastikas and the black cross which was a symbol of the Nazi movement during the reign of Adolf Hitler," said Zohar Meir, one of the initiators of the March of the Living in Hungary, which is scheduled for next month. "There is a very strong wave of anti-Semitism in Hungary,” said Meir, who resided in Hungary in the past. “Based on past experience, these waves are getting stronger as the economic situation becomes more difficult and all the anger is taken out on the Jews," he added. This is not the first vandalism of a Jewish cemetery in Hungary. In July of 2012, vandals desecrated 57 graves in a Jewish cemetery in Kaposvar, some 200 miles southwest of Budapest. The cemetery sustained serious damage worth some 12,000 euros, Jewish community leader Lazlo Rona said at the time. Other anti-Semitic incidents in Hungary in recent years include the country’s chief rabbi being verbally abused on a Budapest street, anti-Semitic chants at a football match against Israel and pig's trotters being placed on a statue of Raoul Wallenberg, the Swedish diplomat who saved thousands of Budapest Jews in World War II. Much of the anti-Semitism has been perpetrated by the openly anti-Semitic Jobbik party. In November of 2012, one of its members released a statement saying that a list should be compiled of all of the Jewish members of government.